As I transition my wardrobe from one season to the next, I thought it might be helpful to share the process of how I choose items for my capsule wardrobe. The less I own over all, the easier it is, but I remember feeling a little overwhelmed trying to pick 33 items for my first capsule wardrobe. I didn’t buy anything new, but instead went shopping in my closet. I cleaned out my closet for good, and spent the next few years letting go of the things I didn’t wear, and incorporating new items as needed. Now in between seasons, it’s just a matter of rotating a few items. Before I put my new list together for fall, I took a look at what I was wearing last fall. I decided to include most of the same items, donated a few pieces that were wearing out, or didn’t fit well, and add new pieces too. It’s really helpful for me to break things up by category; clothing, shoes, accessories, and jewelry. The items in bold are items I used last fall. If it’s not bolded, I’ve included a brief description. The breakdown of clothing items is 4 bottoms, 3 dresses, 8 shirts, 3 outerwear (coats/blazer) including 4 new items. short boots – I might add these, might not. You may notice that I have a bunch of black and white items, but that is not the only way. There are great examples of colorful capsule wardrobes out there, but I’ve discovered that life is colorful enough, and I’m happy dressing in more neutral colors. I don’t have 33 different items for each season. 19 of the items above were in my summer capsule too! 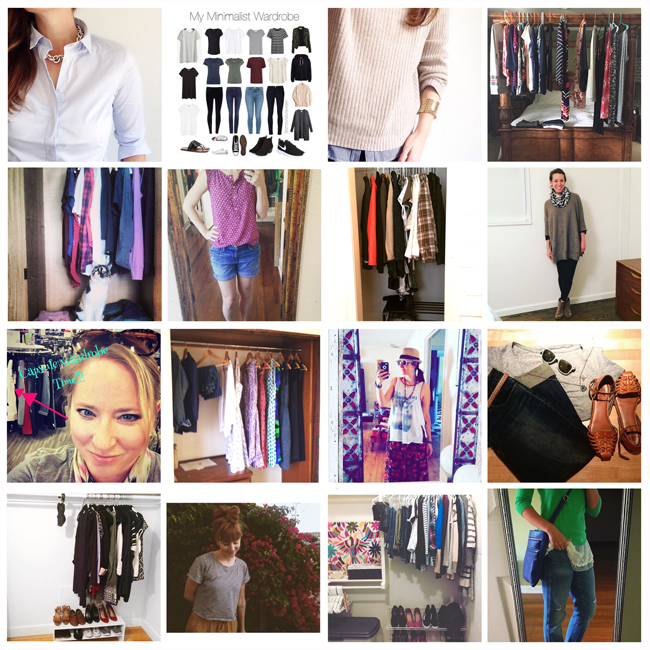 I’ll be sharing pics of my closet and outfits on Instagram, and sharing #Project333 round ups (pictured above) from people who share their inspiring images. Eddie Vedder sang ” if more is less and if less is more, how you keeping score?” in the movie ‘into the wild’. This is how ! I still have a little paring down to do. I go with a lot of blue, but I noticed that my fall and winter items tend to include grays and browns. The neutrals are great. My signature item is a short waisted jacket. For fall and winter I have one in gray wool that can be formal or casual and my olive green denim one I wear almost year round. My new challenges is that I’ve had to add some serious outdoor wear because I work at a nature center and some nice casual because I also work at a museum. I’ve also learned that my rubber boots are not part of my 33 because they are a necessary tool for gardening. Hi Courtney – I’ve just come into my second year with The Project, and yes, I’m one of those with a colourful wardrobe! Black doesn’t suit me, but I do use it for my “core” items a lot. I’ve found, over the year, that the number of “core” items is increasing, while my “subsidiary” items is decreasing. Because I’m keeping track of everything I wear, I’ve realised what gives me good value and what doesn’t, and I’ve learned to focus on flexible items I can wear over and over. I’ve also made plenty of mistakes (buying on sale, impulse buys, failing to return stuff when I should have), but I’m learning! Certainly I’m happier with my wardrobe. I have been looking at capsule wardrobe on internet, instagram, facebook etc, but it seems so much about brands, designers, looks etc. so it makes me stressed. That is why I love your wardrobe and your tips about the wardrobe, Couurtney: it is just “jeans” “tee” “dress” “scarf” etc. That is simplicity in its real meaning. Thanks.